My head has been brimming lately with ideas for simple projects and actions that could make the world a better place. Here's a simple one that doesn't need anyone to organise it, just people to share the idea and adopt it organically. I commute to work by bicycle in a rural area. One of the downsides to that (against the many upsides) is if I get punctures, I have to carry tools and a repair kit to mend them. The basic tools I need are small but it does mean I carry extra weight and for one reason or another I don't always have these tools. If I get a puncture on the way to work without my toolkit, I could limp in and borrow our building maintenance person's tools (if I ask really nicely) to fix the flat. Although they have tools, they don't have any patches or cement etc. But I know in my garage I do have some incomplete sets of spanners and various bike tools and patches and some rubber cement I could spare. I'd bet every cyclist has some. I could bring these to my work and keep them in a tool box and if anyone visiting my office on a bicycle (I know we get 90,000 visitors by car every year) needed tools to mend a flat tyre or adjust some gears etc., they would be able to use them free of charge. Then, if they felt like repaying this kindness, they could make a small donation or provide anything missing or even set up their own bicycle aid kit somewhere else. 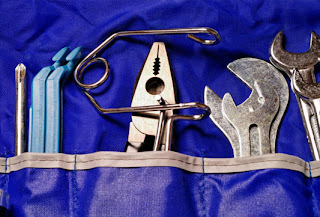 It only needs to be the simplest and cheapest tools. A few weeks ago when taking my bicycle on the train to a meeting in Ipswich, a fellow cyclist in the carriage was having a problem with their derailleur and they were getting advice from two other cyclists while they dismantled the mechanism and rebuilt it again in just a few minutes with a borrowed Swiss Army knife and my Gerber tool. Experienced cyclists become resourceful and you learn that giving assistance is good karma as you could easily find yourself in that predicament too. Most technical problems with bikes can be fixed well enough with basic tools to get you home or to a bike shop for specialist help. All it would take is some kind of recognised symbol to be displayed that whatever premises are participants in the 'bicycle aid' scheme. The tools and supplies could be provided, replenished and used on an 'honesty-box' basis and their upkeep could be sponsored by individuals, businesses or cycling clubs. Once a common name and symbol is established, people might kindly take the trouble to record their locations on the web such as on Google maps or similar. This way another barrier to cycling could be overcome. I also reckon it makes a lot of sense for businesses to act as good Samaritans to their visitors. Many years ago during a coast-to-coast driving holiday in the USA I visited Disneyland in Anaheim, California. After a wonderful day at the "happiest place on earth" I got back to my rental car to find I had a flat tyre. I started the laborious process of unloading the car to get to the spare tyre out when a Disney tow truck pulled up and the driver offered to change the tyre for me. The driver explained that with thousands of visitors a day, such events were likely to happen and the Disney Company didn't want anyone feeling their vacation had been ruined by such events in their park, so it was just good customer relations to provide a free tow-truck service for visitors (it also ensured the parking lot was empty by the required time and limited the chance of me hurting myself by jacking up a car on their property). With the proper tools and jacks, the tyre was changed by the tow truck driver in under a minute. Obviously I have not forgotten this kindness and despite my personal criticisms of the company on other counts, I reckon Disney sets a gold-standard for customer service. There must be countless other benefits for businesses that engendering a sense of hospitality and promoting the benefits of cycling by providing a simple 'bicycle aid' kit, which would cost them nothing to establish, would result from this. If someone could create a logo that could be recognised universally and post it on the web, then perhaps we could get this started. I despair at the sight of this. Last Sunday, at my child's behest, I queued in a pub garden for twenty minutes to pay £3 for a mystery beefburger. The Geldeston Locks Inn is renown for good food but with 1000+ people turning up for May Day celebrations, running a bbq stand in the garden must have seemed to the management a good idea and, at this price, it must be extremely profitable. So why do they risk their reputation by preparing and serving food in such a substandard way? The anemic grill could barely keep up with demand (and at these prices they could have bought a professional grill with under half an hour's takings) and the meat patties were the frozen ones filled with cereal and binders you can get in every cash & carry. It must be because the punters hardly know anything different. This is what they expect. They don't have any higher expectations. They have never been to the Apple Pan where famously grumpy servers can deliver the most delicious burgers in about twenty seconds and have wrapping it in greaseproof paper down to a folk art. While chefs (at least he was dressed as a chef) serve such crap with total indifference to their customer, McDonalds market share is secure.